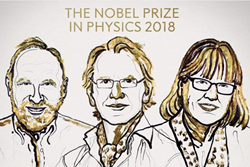 The Nobel Prize, a prestigious set of six annual international awards bestowed upon recognition of academic, cultural and scientific advances, was awarded this year to Arthur Askin, Gérard Mourou and Donna Strickland for their combined achievements in laser physics. Arthur Ashkin, winner of half of the Nobel Prize, invented the tool known as optical tweezers. Through applying lasers with a specific configuration, tiny particles like atoms and viruses can be moved with the optical tweezers. How the optical tweezers operate is through pushing small particles towards the centre of the laser beam and pinning them, with high levels of precise control achieved through lasers. Through slight adjustments to the laser’s properties, the pinned particles can be moved in specific ways. The ground-breaking aspect to Ashkin’s design was when he was able to use the optical tweezers to capture living bacteria, without changing its properties or damaging the bacteria in any way. The advantages of Ashkin’s invention have been utilized across wide areas of study, from that of biological systems and individual cells, to investigating the lifespan of machinery. One common misconception about laser light is that it is continuously emitted – this isn’t necessarily the case. When laser light is applied to processes, the general options are to save up all the laser light for one short burst, or to have multiple short bursts with relatively high frequencies. However, the risk with both of these techniques is that the material used to amplify the light could be destroyed. Gérard Mourou and Donna Strickland solved the other half of this equation, with their technique of Chirped Pulse Amplification. Mourou and Strickland created an ultra-short, high-intensity laser pulse that could be repeatedly used, without damaging the amplifying material. The standard laser pulses were stretched in time, which reduces their peak power and makes them less destructive. The pulses were then amplified, which when time-stretched allows for the material to survive the amplification process. The amplified pulses were then compressed in time. Through this process of making the pulses shorter, more light becomes packed together in the same space allowing for a mass increase in pulse intensity without the material damage. This technique has been used as the standard for high-intensity lasers and is used in millions of corrective eye surgeries performed annually, with more applications being discovered across broad fields of study and commercial industries. While it is easy to take laser technology for granted, with its integral role in the manufacturing processes of many day-to-day products, this year’s Nobel Prize has undoubtedly set the standard for physics and the future of the photonics industry.